To be used by Pro Se litigants in actions filed under 42 U.S.C. § 2000e, et seq., (Title VII of the Civil Rights Act), 29 U.S.C. § 621, et seq., (Age Discrimination in Employment Act), OR 42 U.S.C. § 12112, et seq., (Americans with Disabilities Act). 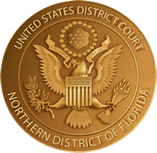 Click here for instructions for filing the Employment Discrimination Complaint with the Court.